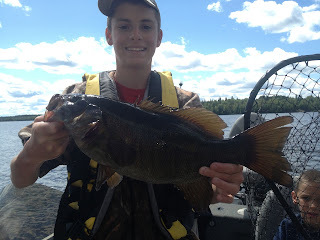 Drew caught and released this nice Smallmouthe Bass while fishing at Paquette's Camp, Nice fish Drew! 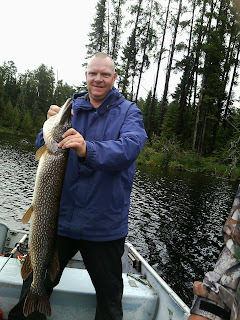 Jim Tops off his week at Paquette's Camp with this nice 39 1/2 inch Northern Pike! It may not look very manly sitting in the flowers, but Shane is happy with his first bear. Shane got this nice 225 pound bear on the 2nd day of his hunt at Paquette's Camp. Of course Dan got his bear on the 1st day,sorry no pictures werej gotten of that one. The weather has been all over the map the middle of Aug. we had the heat on in all the cabins and this past week it was close to 90 for a few days. It has been a very wet summer over all, but at least it isn't snow. That will be coming soon enough. It does not seem possible that fall is almost here already. I will have my first group of Bear hunters here in a couple of hours, I would expect that by tomorrow night a couple of them should have their Bears! It has been a lot of work getting the bears to the baits with all the blueberries this year. There are more berries this year than there has been for a long time. I will keep you posted on the hunters results. The groups of Moose hunters will be here starting the middle of Sept. hopefully I will have some pictures of nice moose shortly afterword. Thefishing has been good overall the past few weeks, Jim even caught the biggest Pike of his life the other day, 39 and 1/2 inches, congratulations Jim mabye next year you can go for a bigger one. The Walleye fishing has remained steady , no one has had problem having enough fish for supper! Theprojects have been getting done over the summer, I almost feel caught up but not quite. I finished my last roof the other day before it started raining and it didn't even leak when I was done. I still have one cabin redo the siding , facia and soffit and then most of the major projects will be caught up. Sue will be going back to school next week, Chad left for Hamilton yeaterday and will be going to the university there, it is about 10 hrs from here so we will not be seeing much of him for a while. It will seem quiet here with them gone every day. I guess fall is here. about a month and we will have wrapped up another year.